Villa Yang Som is a high quality rental villa located at Surin beach. 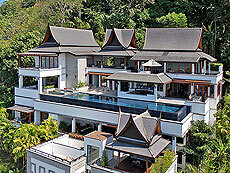 The villa nestled on hillside surrounded by natural tropical trees with panoramic sea views of the Andaman Sea. Contemporary Thai style decoration and comfortable furnishing with bright sunlight comes inside the villa makes everyone could enjoy delightful stay in Phuket. Location of the villa just a few minutes ride to Surin beach is suitable for enjoy not only villa stay but also outdoor activities.